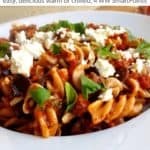 Weight Watchers Tomato Chicken Feta Pasta, a quick and easy pasta dish with tomatoes, chicken and feta cheese that’s delicious warm, or chilled. 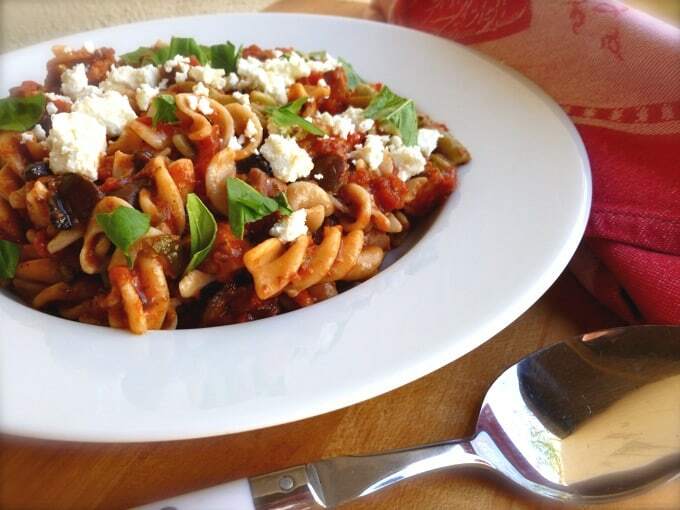 This chicken pasta with feta and tomatoes is adapted from a recipe in Weight Watchers Our Best Quick & Easy Meals (affiliate link) cookbook (which, by the way, is a treasure trove of ideas for getting dinner on the table in a dash), replacing a few of the ingredients with what I had on hand. This Tomato, Chicken and Feta pasta is a great way to use up leftover rotisserie chicken, but I chopped up a piece of roasted sun-dried tomato turkey breast that I had in the fridge instead. The original recipe called for 1 cup of dry pasta for 6 servings, which seemed a little scant to me, since I’m the only one in the family eating Weight Watchers-size portions. So, I doubled the amounts of pasta and diced tomatoes called for and created a dish that everyone really liked. According to my calculations, each generous 1-1/3 cups serving has 296 calories, *7 Weight Watchers PointsPlus, *4 WW Freestyle SmartPoints. Enjoy! 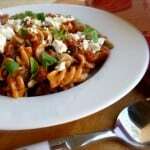 If you’ve made this Chicken Pasta with Tomatoes and Feta, please give the recipe a star rating below and leave a comment letting me know how you liked it. And stay in touch on Pinterest, Facebook, Instagram and Twitter for the latest updates. 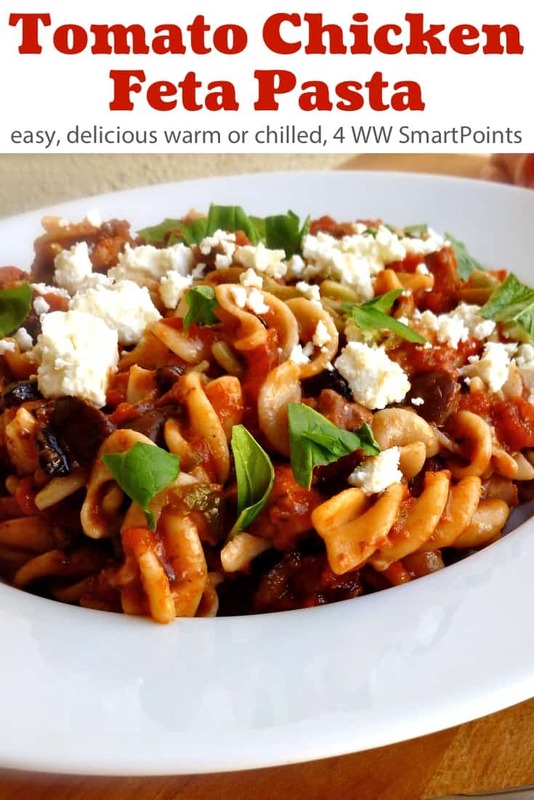 A quick and easy pasta that's equally delicious served warm or chilled. Cook pasta according to the package instructions, reserving 1 cup of the pasta water before draining. While the water boils and pasta cooks, heat the oil in a large nonstick skillet over medium heat. Add the garlic and cook, until fragrant, about 30 seconds. Add the tomatoes, chopped cooked chicken and olives, and simmer, stirring occasionally, until the mixture thickens, about 15 minutes. When the pasta is done, reserve a cup of water and then drain and return the pasta to the pot. Add the tomato mixture to the pasta, and toss gently to combine, adding a little water, if necessary to thin it out. Top with feta cheese and basil, if using.